Most pipe tobaccos are composed of several different kinds of raw tobacco, and in each raw tobacco there are different grades. The names of the raw tobaccos are common knowledge, but the grades are determined by the tobacco companies. At Orlik Tobacco Company there are about 120 different grades available. The Orlik Tobacco Company is known in the industry for frequently purchasing the most expensive raw tobaccos. They want high quality with exactly the taste and strength that the individual tobacco mixture demands. It takes at least 10 years of daily work in a raw tobacco department to learn about grading them. But the raw tobaccos themselves, referred to her as basic tobaccos, you can get to know in a couple of minutes. Virginia tobacco is the most widespread basic tobacco. Virginia is named after the State of Virginia in USA, where this tobacco was first grown. Today Virginia tobacco is grown in many other countries. The other important growing areas for Virginia tobacco are southern Brazil, Zimbabwe and China. Virginia tobacco leaves are 20-50cm long and light golden to dark mahogany in colour. The leaves are harvested one by one when each is ripe, and dried in hot air. Virginia tobacco has a high content of natural sugar. The taste is characteristic and has a naturally sweet and aromatic taste, which varies with the degree of ripeness. In their pure state, some Virginia tobaccos with a high natural content of sugar can seem a bit sharp in taste when they are smoked. Virginia tobaccos vary in strength from very mild to medium, depending on where the leaf is positioned on the plant, and on the local growing conditions. Burley is the other main basic tobacco used in pipe tobaccos. Burley tobacco originates from the State of Kentucky in USA, which still accounts for a large part of world production. Among the other important growing areas for Burley are Malawi, Mexico and southern Brazil. Burley tobacco leaves are 20-50cm long, the colour varying from light brown to very dark brown. When the middle leaves are ripe, the whole plant is harvested and then air dried. The aroma of Burley tobacco is dry and aromatic, rather like chocolate. Burley tobacco's stronger character is due to the low content of sugar in the leaves. Accordingly, Burley tobacco is dried naturally in air for a month, away from sunlight. The taste of Burley tobacco is relatively strong, full and dry. The taste changes if the tobacco is roasted at very high temperatures. In this way the tobacco's fine aroma comes out fully, and the taste and strength become round and full, almost nutlike.The same process is used to draw out the fine tastes nuances in coffee. Oriental tobacco originates from the eastern Mediterranean. Today, the best quality leaf is grown in Turkey and Greece. The leaves of Oriental tobacco vary in size and shape, from small heart shaped leaves of 2cm length to larger arrow shaped leaves of 15cm length. The colour of Oriental tobacco leaves varies from light golden to dark orange, but certain types have leaves of a dark greenish hue. Oriental tobacco is typically very mild in strength with a slightly sweet and strongly aromatic taste. The strong aroma is developed because the tobacco is grown in very dry conditions; the tobacco plant forms a layer of wax on the leaves to prevent them drying out. This layer of wax contains natural aromatic oils. Oriental tobacco is picked by hand, leaf by leaf. After harvesting the leaves are hung in garlands and dried in the sun. Latakia tobacco originates from the Syrian port of the same name, whence it was shipped to Europe in olden times. Today Latakia tobacco is mainly grown on Cyrpus. Latakia tobacco is an oriental tobacco which, after drying, is smoked over special woods. This gives the tobacco a smoked and highly characteristic aroma. During the process the colour darkens to black. The strength is mild, but the powerful aroma often causes smokers to confuse the strength of taste with the strength of the tobacco. Kentucky tobaco originates from the State of Kentucky in Eastern USA. Today most of the world's production of this tobacco comes from Kentucky and Tennessee. Kentucky tobacco is also grown in Indonesia and south east Africa. The leaves of Kentucky tobacco are 30-70cm long, and have a uniformly dark brown colour. The strength varies from medium to very strong. The relative strength of Kentucky tobacco is due to extensive mulching of the soil under the tobacco plants to obtain leaves which are thick and very oily. Kentucky tobacco is otherwise grown and dried as for Burley tobacco. After drying, Kentucky tobacco is smoked in a similar way to Latakia, but not so intensely. Besides its smoky flavour, the taste is very full and slightly sweet. Perique is the rarest of the basic tobaccos used in pipe tobaccos. Perique is only grown in one place in the world; St. James's Parish in the state of Louisiana in south eastern USA. Only a few barrels of this tobacco are produced each year. During the growth of Perique tobacco, the tip of the plant is nipped off so that the plant concentrates all its juice and aroma in the relatively few but large remaining leaves. Perique tobacco's strength and aroma is the strongest of all basic tobaccos. After drying and hand stripping of the central leaf stalk, the tobacco leaves are placed in old barrels which have formely been used for storing bourbon whiskey. A special liquor is added to the tobacco leaves, which are packed under high pressure in the barrels. Here they are stored for several years before the tobacco is ready for use. Black Cavendish is the only basic tobacco which is not grown, but made in tobacco factories from other basic tobaccos. Black Cavendish can be made from Virginia, Burley and other air-dried tobaccos. Production takes place either by adding a liqour to the tobacco, after which it is simultaneously pressed and heated, or by treating it with steam and warming it up simultaneously. The tobacco turns completely black as a result hence the name. It also becomes milder, with a rounder and sweeter taste. 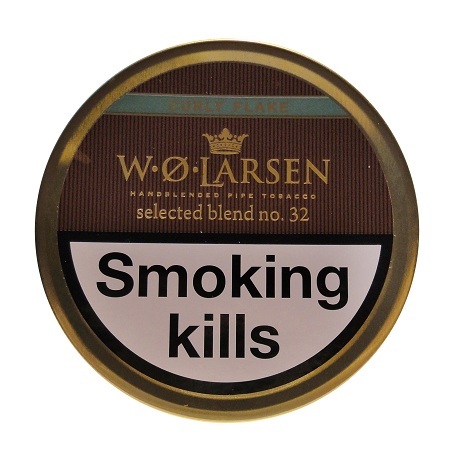 The black colour shouldn't tempt one into thinking that it is a stronger tobacco. Black Cavendish is in fact the mildest of all the basic tobaccos. Black Cavendish is named after an English sea captain, who originated the production method in the 16th century. The remarkable Dane with the pleasant cherry aroma. A blend of bulk cured Black Cavendish, fine Burley Tobaccos and Golden Virginia grades. Deliciously flavoured with a combination of black and wild Cherry aromas - a unique combination created from one of our very old recipes. This very mild blend is characterised by the Black Cavendish tobacco refined by our secret process. The blend is then complemented with a touch of light and bright, sweet Virginia leaf. 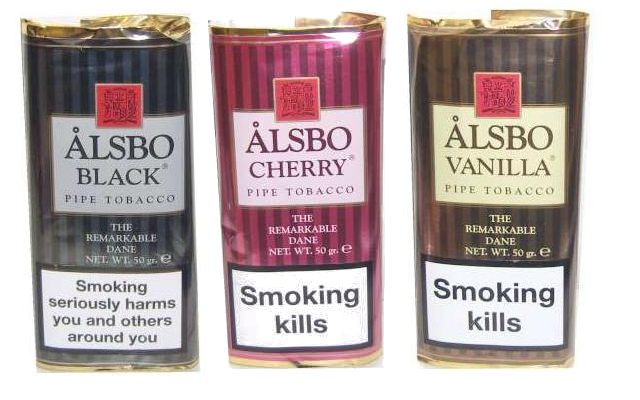 Alsbo Black has a delightful vanilla type flavour, giving an extremely pleasant taste and room-note. The remarkable Dane with the unique vanilla aroma. Bright and mild Virginia Tobaccos blended with our super mild Black Cavendish create a mixture of outstanding quality. Our smooth vanilla flavour adds extra character and a perfect balanced taste and room note. This very special blend consist of the finest lemon and orange coloured Virginia tobaccos from the best districts in the USA and Zimbabwe. Rolling the tobacco into bars is a work of art. The rolls are pressed square, cut and finally packed by hand.